Have you played the brand-new Temple Tumble MegaWays slot yet? Mr Green Casino are celebrating the release by giving you the chance to get up to 50 bonus spins. The Temple Tumble Free Spin promotion runs today only – Thursday the 7th of February (2019). To take part, you need to opt in via the special deposit page found once you login to your Mr Green Casino. You need to then deposit and play £30 or more – you will receive 1 bonus spin for every £2 you deposit and wager/play. 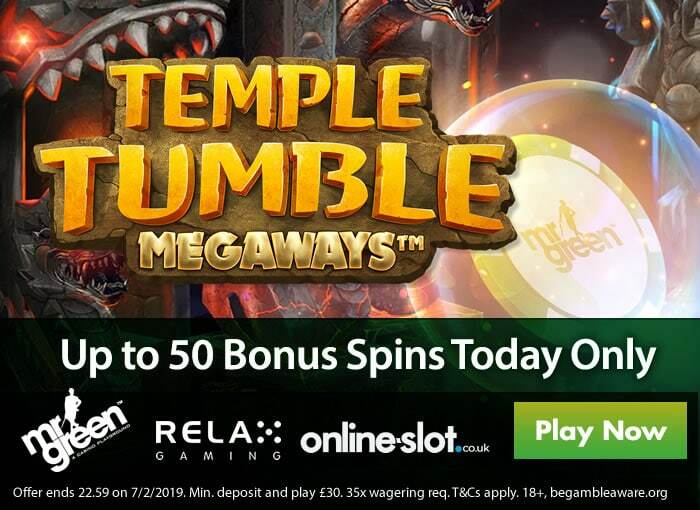 To get the full allocation of 50 bonus spins on offer, you would need to deposit and wager £100 – the bonus spins will be valid only on Temple Tumble MegaWays and will be worth 20p each. Any winnings will be subject to 35x wagering requirements and the bonus spins will be valid for 7 days after release. Temple Tumble MegaWays is the latest slot from Relax Gaming and uses the popular MegaWays game mechanic from Big Time Gaming. Played on a 6×6 grid, you join explorer Kane on a highly volatile adventure through the jungle from as little as 20p per spin – there’s up to 46,656 ways to win. It comes with cascading wins meaning winning symbols are destroyed and replaced with new ones – this can lead to consecutive wins from each spin. If you manage to break all the stone blocks on screen, you will enter the Free Spins feature where you begin with 6 free spins. You then choose from 3 modes – you can get extra free spins, multipliers up to 3x or extra free spins and multipliers. High variance, you can win 7,677 times your total stake on each spin. Go to the Temple Tumble MegaWays slot review for more details. Not played at Mr Green Casino before? Begin your adventure with 20 exclusive no deposit bonus spins on NetEnt’s Starburst. On your first deposit, you will get a 100% match bonus up to £100 as well as 200 more bonus spins across various NetEnt slots.